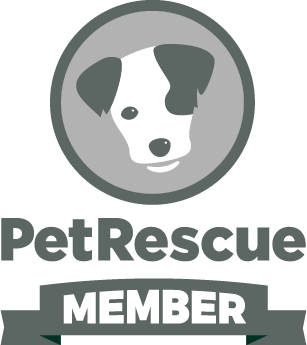 Small rescue group based in the Newcastle NSW area. Will take surrenders and rescues from pounds. This is Kuni and he is a very handsome and regal looking boy about 18 months old. He has very beautiful eyes that match so well with the colours of his coat. Kuni is a tall boy with a lean physique, and we think he might have some greyhound in him; he loves to run, and he is capable of a good speed, and sometimes, when he turns his head, the shape is there. He is a very playful boy who loves to wrestle with his kennel mate, and they chase each other around the yard until it’s time to have a rest. Kuni would love to be part of an active family. He LOVES the water and would no doubt have a ball at the beach. In the short term he jumps in a clam shell each day and splashes up the water with his feet, creating a mini sunami and biting at the waves. It’s a great way to cool down, and he loves it. But he would love to go for a run too and would surely be able to go the distance. We’re not sure whether Kuni likes cats, but if we had to guess we’d say No. We think the fun of a chase might be too much for him. He would also be too active for small children. Kuni would benefit from some training, and it would be an ideal way for a new owner to bond with him. He is a very affectionate boy and would be a great mate for someone, and a great member of a family. If you’re interested in finding out more about Kuni please phone Lynda; if phoning on a Monday, Tuesday, or Wednesday please call after 7.30pm and before 9pm: 0401 264 514. Thursday to Sunday phone any time. Alternatively send a text, or email allbreedsdogrescue@gmail.com, or download an application form from our website. 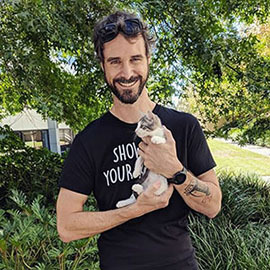 Kuni will be available for meet and greet near Raymond Terrace in the Newcastle area -- not far from the end of the M1 if you are travelling up from Sydney. Meet Tupac. 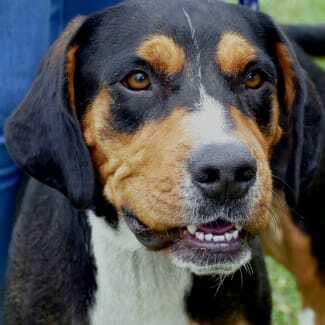 He is a beagle x Rotty around 2 and a half years old and a real character. This boy LOVES people and other dogs, and wants to be right at the centre of everything that happens. He is a very smart boy, very affectionate, and wise enough to work out what’s going on in his world, or what is about to. Tupac is mostly a calm boy who keeps his 4 feet on the ground, but he likes to have fun with the other dogs too and will join in with whatever game they are playing. We are told that in his previous life he was friends with a cat, although there are no cats at his foster-carer’s house and we haven’t witnessed it for ourselves. Most of the women who have visited Tupac’s foster-carer have fallen in love with him and want to take him home. He knows how to impress and how to get to people’s hearts, and you can almost see him give you a wink as the ladies swoon and wish he was theirs. Tupac is quite a strong boy and not particularly tall. He is not very difficult to walk on a lead but brush-up training would be beneficial. He responds well to training and likes to please. He travels well in the car and enjoys watching things pass by out the window. If you would like to find out more about this special boy please phone Lynda. If phoning on a Monday, Tuesday, or Wednesday please call after 7.30pm and before 9pm: 0401 264 514. Alternatively send a text, or email allbreedsdogrescue@gmail.com and request an application form. Other days phone any time. Tupac will be available for meet and greet near Raymond Terrace in the Newcastle area -- not far from the end of the M1 if you are travelling up from Sydney. We feel very privileged to be listing for adoption this very beautiful dog. 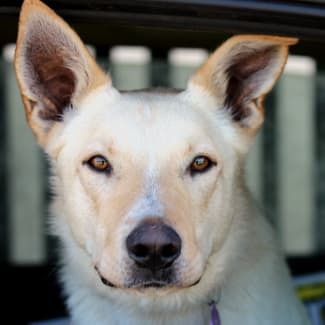 Snow is a kelpie x border collie aged 14 months, and what a stunning-looking boy he is! As his name suggests his coat is white, but a light dusting of gold runs through it as if someone applied it with a powder puff. And to match his physical beauty Snow has a lovely, happy personality. Add those two together and bingo! you’ve got a winner! Snow came from a country area and we think he hasn’t experienced some things – at least not the sort of things you experience in the big smoke. The first time he saw a cat at his foster-carer’s house he was frightened of it. Admittedly the cat was shocked to see him as well, but after a few cautious sniffs satisfied their curiosity they look like they might be a team. And walking beside noisy traffic was a surprise to him as well, but he is becoming accustomed to it like any city boy. Toys are one of his favourite things, but the first time he was given one that squeaks he nearly jumped out of his skin. Nevermind, once he was over the shock he tossed it around a few times to remind it who is boss (although it still squeaks). This boy really loves the water. I mean REALLY loves it! If you've got a fishpond he'll be in it -- or a clam shell full of water is fun too. But if you take him to the beach or the river he'll be in the water before you get his lead off, and he swims, doesn't just paddle around the shallows. Yes, give him a home where there is water in the equation and he'll think he is in heaven! Snow’s foster-carer has been working very hard taking him to training classes – up and at’em at 8 am on a cold Sunday morning. We’re happy to say Snow is very smart and quickly understands what is required of him. He can be a bit stubborn at times, and he can find the whole outing very exciting, but as soon as the treats come out that mysteriously disappears and he is back in focus again. Snow can sit and drop, and is learning to walk well on a lead. He gets better every session. Travelling in the car is not a problem for our boy; if it’s a short journey he likes to look out the window. If it’s a bit longer he appreciates having some cushions or something soft to lie on and he settles down and relaxes. If he gets excited he might want to come visit you in the front of the car, so a good harness is the way to go. There are no children at his foster-carer’s house but we have noticed that Snow would like to stop and say hello to the kids he passes while on his walk. We don't expect that he would have a problem with kids, he wants to play with them. However, we don’t think he would be suitable for very small children, because he could knock them over. Because he is a cross of two very smart working breeds Snow would not suit a home where he was left on his own in the backyard. An active owner would be good, someone who could regularly run him or take him for long walks, especially on the beach, and someone who understands well that he needs to keep his mind occupied as well as his body to be happy. We want him to be treated as a member of the family that adopts him. To find out more about Snow please phone Lynda. If phoning on a Monday, Tuesday, or Wednesday please call after 7.30pm and before 9pm: 0401 264 514. Alternatively send a text, or email allbreedsdogrescue@gmail.com and request an application form. Other days phone any time. Snow will be available for meet and greet in Kotara, a suburb of Newcastle. 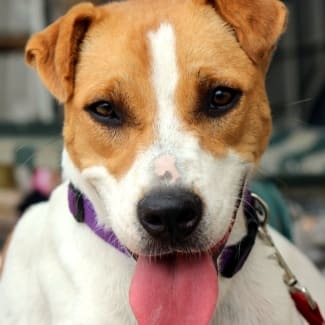 Meet Lucy Goosie, our staffy x shar pei x kelpie girl with a very expressive and unusual face. Lucy is a bit of a comedy act and often has a frown on her forehead as if continuously contemplating something that doesn't have an answer, like how she got to be a shar pei/kelpie/staffy X, or ‘Why isn’t dinner available 10 times a day?’ ‘cause she loves her food. Lucy has kelpie ears and a soft Shar pei muzzle which is good for kissies. She doesn’t have any of the folds of a sharpie and her coat is short and easy care. She is only around 16 months old and still thinks life is a ball of fun. 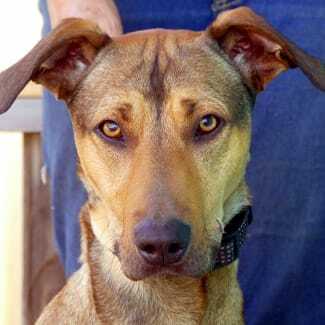 She is quite intelligent, and that will be the kelpie side of her, so she would not suit a home where she was left alone in the back yard for long periods of time. Her size is on the small side of medium. Lucy is living with a number of other dogs at her foster-carer’s home and doesn’t seem fazed. Her best mate is a female shar pei X girl called Babe. They are both black, and hang together like 2 dogs in uniform. 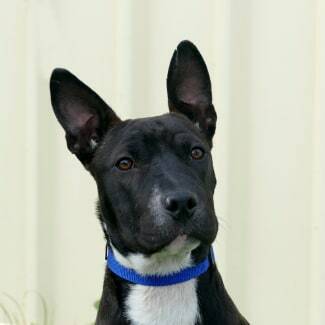 Some training would be beneficial for Luce so it would be good to find her a home where someone is experienced in training their dog, or someone who might take her to some classes. But volunteers at the rescue will soon be working with her to give her manners a brush up. Lucy will best suit a home with active companions who can take her for regular walks or a run, and who treat her as a member of the family. If you feel that she’s your kind of gal, you’ll be rewarded with lots of laughs and a lovable and loyal companion who will be devoted to you and your family. To find out more about Lucy Goosie please phone Lynda: if calling on a Monday, Tuesday, or Wednesday please call after 7.30pm and before 9pm. Other days phone any time. 0401 264 514. Alternatively send a text, or email allbreedsdogrescue@gmail.com and request an application form. Lucy will be available for meet and greet near Raymond Terrace in the Newcastle area -- not far from the end of the M1 if you are travelling up from Sydney. This is the gorgeous Alfie. He is only just over 12 months old, and he’s our favourite mystery man. See, we can’t quite work out what his breeding is … he has the look of a Jack Russell but his size doesn’t correlate; and the ears! Where did he get those ears? Musta been the reject shop. But seriously, Alfie is a lovely boy, and it doesn’t matter if we don’t know for sure what his breeding is; he’s very handsome, and lots of fun, and he’s just looking for someone to love him. We’re looking for someone to love him too. Alfie is a reasonably tall boy, and he is very elegant. 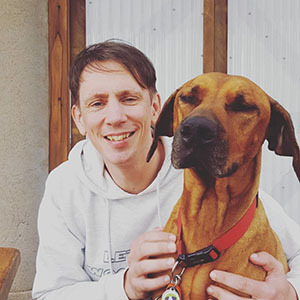 He looks like he belongs in one of those pictures you see in glossy magazines – the ones where there is a gorgeous woman in killer stilettos holding a tall, elegant dog beside her on a lead. That’s our boy! Presently he is quite an active dog but he is still a baby so no surprise there. He loves to run around with his doggie mates and he’s always available for a wrestle. Yep, life’s pretty much a box of chocolates. We don’t have much information on Alfie’s background; he came to us in good condition, perhaps a little lean, but he’s a happy boy who loves people. He can be a little excitable when he first meets new people but that should fade as he matures and settles. To indicate his height -- the top of his head comes to a few inches (approx. 7 cm) above the knee of a 5ft 6" (168 cm) person. He will not grow any taller now, but he'll fill out more. We don’t think it would be a good idea to home Alfie with cats or chickens, nor with little dogs, but he likes to have a doggie mate to wrestle with. We are currently giving him some lead and manners training and he responds well, especially for treats. To find out more about this gorgeous boy please phone Lynda. If phoning on a Monday, Tuesday, or Wednesday please call after 7.30pm and before 9pm: 0401 264 514. Alternatively send a text, or email allbreedsdogrescue@gmail.com and request an application form. Other days phone any time. Alfie will be available for meet and greet near Raymond Terrace in the Newcastle area -- not far from the end of the M1 if you are travelling up from Sydney.